Provided here is an overview on the current copper industry, including common and emerging uses of copper, where copper is produced, who is producing it, refinement techniques, and what other materials are being produced alongside copper. 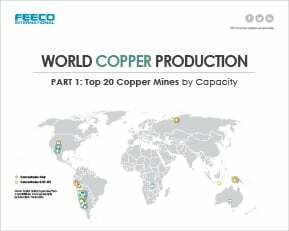 Click on the image below to view the infographic showcasing the top 20 copper mines by production capabilities, along with the owners and what other materials were produced. Once mined, copper ore goes through a series of processing stages in order to refine it into a saleable copper product. Copper can be refined by one of two approaches: pyrometallurgy or hydrometallurgy. The pyrometallurgical approach, often referred to as smelting, is the primary method used for refining copper. In this process, used for sulphide ores, copper concentrates are thermally treated in a smelter and then refined into a pure copper product. Of the top 20 copper mines listed by ICSG, half produced copper by the pyrometallurgical approach alone. The hydrometallurcial approach to refining copper ore is known as solvent extraction electro-winning (SX-EW), or leach solvent extraction electro-winning (L-SX-EW) for its convergence with the heap leaching technique. SX-EW is a series of steps whereby ore is heap leached to obtain a pregnant solution, then combined with an extractant/reagent in order to produce an electrolytic-bearing copper solution from which copper can be electrowon. SX-EW has become a critical tool in the copper industry, as it can be used where smelting is not an economically feasible option, namely to process oxide and low-grade sulphide ores. Of the top 20 mines, half incorporated SX-EW into their operations. It is not uncommon for copper mines to process additional metals at their facilities. Many copper mines also produce gold, silver, and/or molybdenum, and less commonly, may also produce platinum group metals, nickel, zinc, and even uranium. Copper’s unique combination of properties lend it to a diverse range of applications. The production of copper is just as diverse as its uses, with mines scattered all over the globe and several industry magnates accounting for production. The two refinement techniques – copper smelting and SX-EW – allow both traditional ore sources as well as oxide and low-grade sulphide ores to be processed, with many materials often produced alongside copper. 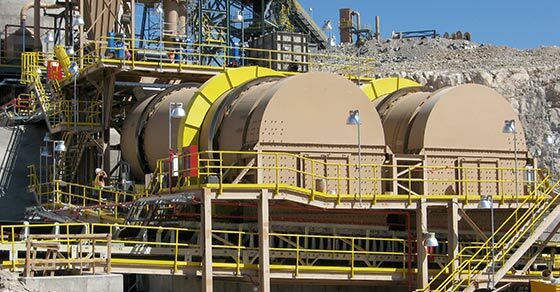 FEECO provides heavy-duty pug mills (paddle mixers) for use in the copper smelting process, as well as agglomeration drums (ore drums) for use in the heap leaching/SX-EW process. Some of the world’s largest and most environmentally advanced copper mines rely on FEECO for the best in process equipment. For more information, contact us today!